As a reviewer you do your utmost not to be biased (whether for or against) but when I read that Holy Dragons were from Kazakhstan, I couldn’t help being a tad sceptical. I mean how good can a Kazakh Metal band be? Quite good, as it turns out. Holy Dragons’ music seems trapped in an era when dinosaurs ruled the earth, those dinosaurs having names such as Iron Maiden, Judas Priest and Weapon. 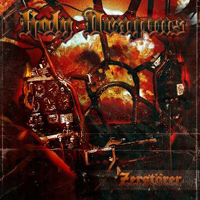 Decidedly old-school material therefore but Holy Dragons have managed to put together some solid Heavy Metal that can still be enjoyed even when the novelty factor wears off. Unsurprisingly “Zerstörer” scores low on originality and there are several times when you feel your interest waning. Just when you’re about to stop your CD player, however, along come some blazing riffs (as in ‘M.A.D. Mutual Assured Destruction…’) or some catchy Maiden-style guitar melodies (as in ‘HL7442’). 14-minute epic ‘Cuban Crisis’ has the band trying to leave their own imprint on the music and is a good example of their songwriting skills. Occasionally the album even has some well-played acoustic guitar arpeggios to provide some respite from the heaviness. All this is great but the album’s main selling point is the singing of Ian Breeg who makes an impressive effort at singing like Rob Halford. If you’re a Keep-It-True type of Metalhead, than this is one album you might want to check out.